you must keep the temperature within prescribed limits. The absorption of heat by the quenching medium also depends, to a large extent, on the circulation of the quenching medium or the movement of the part. Agitation of the liquid or the part breaks up the gas that forms an insulating blanket between the part and the liquid. Normally, hardening takes place when you quench a metal. The composition of the metal usually determines the type of quench to use to produce the desired hardness. For example, shallow-hardened low-alloy and carbon steels require severer quenching than deep-hardened alloy steels that contain large quantities of nickel, manganese, or other elements. Therefore, shallow-hardening steels are usually quenched in water or brine, and the deep-hardening steels are quenched in oil. Sometimes it is necessary to use a combination quench, starting with brine or water and finishing with oil. In addition to producing the desired hardness, the quench must keep cracking, warping, and soft spots to a minimum. The volume of quenching liquid should be large enough to absorb all the heat during a normal quenching operation without the use of additional cooling. As more metals are quenched, the liquid absorbs the heat and this temperature rise causes a decrease in the cooling rate. Since quenching liquids must be maintained within definite temperature ranges, mechanical means are used to keep the temperature at prescribed levels during continuous operations. The two methods used for liquid quenching are called still-bath and flush quenching. Instill-bath quenching, you cool the metal in a tank of liquid. The only movement of the liquid is that caused by the movement of the hot metal, as it is being quenched. For flush quenching, the liquid is sprayed onto the surface and into every cavity of the part at the same time to ensure uniform cooling. Flush quenching is used for parts having recesses or cavities that would not be properly quenched by ordinary methods. That assures a thorough and uniform quench and reduces the possibilities of distortion. Quenching liquids must be maintained at uniform temperatures for satisfactory results. That is particularly true for oil. To keep the liquids at their proper temperature, they are usually circulated through water-cooled coils. Self-contained coolers are integral parts of large quench tanks. Figure 2-3. - Portable quench tank. A typical portable quench tank is shown in figure 2-3. This type can be moved as needed to various parts of the heat-treating shop. Some tanks may have one or more compartments. 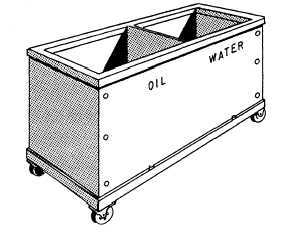 If one compartment contains oil and the other water, the partition must be liquid-tight to prevent mixing. Each compartment has a drain plug, a screen in the bottom to catch scale and other foreign matter, and a mesh basket to hold the parts. A portable electric pump can be attached to the rim of the tank to circulate the liquid. This mechanical agitation aids in uniform cooling. Water can be used to quench some forms of steel, but does not produce good results with tool or other alloy steels. Water absorbs large quantities of atmospheric gases, and when a hot piece of metal is quenched, these gases have a tendency to form bubbles on the surface of the metal. These bubbles tend to collect in holes or recesses and can cause soft spots that later lead to cracking or warping.